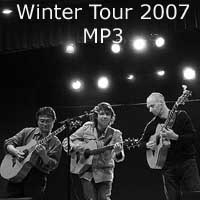 An exciting compilation of live recordings from the CGT's 2007 Winter Tour. This download also includes photos taken during the tour by Hideyo, Paul, Bert and Joe Del Tufo. Recorded in February and March 2007 during CGT's Winter 2007 Tour. Recorded by Tyler Trotter and Aaron Chadwell.